Claude-Frédéric Bastiat (/ˌbɑːstiˈɑː/; French: [klod fʁedeʁik bastja]; 29 June 1801 – 24 December 1850) was a French economist, writer and a prominent member of the French Liberal School. 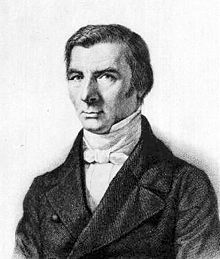 A Freemason and a member of the French National Assembly, Bastiat developed the economic concept of opportunity cost and introduced the parable of the broken window. As an advocate of classical economics and the economics of Adam Smith, his views favored a free market and influenced the Austrian School. Bastiat was born on 29 June 1801 in Bayonne, Aquitaine, a port town in the south of France on the Bay of Biscay. His father, Pierre Bastiat, was a prominent businessman in the town. His mother died in 1808 when Frédéric was seven years old. His father moved inland to the town of Mugron, with Frédéric following soon afterward. The Bastiat estate in Mugron had been acquired during the French Revolution and had previously belonged to the Marquis of Poyanne. Pierre Bastiat died in 1810, leaving Frédéric an orphan. He was fostered by his paternal grandfather and his maiden aunt Justine Bastiat. He attended a school in Bayonne, but his aunt thought poorly of it and so enrolled him in the school Saint-Sever. At age 17, he left school at Sorèze to work for his uncle in his family's export business. It was the same firm where his father had been a partner. Bastiat began to develop an intellectual interest as he no longer wished to work with his uncle and desired to go to Paris for formal studies. This hope never came true as his grandfather was in poor health and wished to go to the Mugron estate. Bastiat accompanied him and cared for him. The next year when Bastiat was 24, his grandfather died, leaving him the family estate, thereby providing him with the means to further his theoretical inquiries. Bastiat developed intellectual interests in several areas including philosophy, history, politics, religion, travel, poetry, political economy and biography. After the middle-class Revolution of 1830, Bastiat became politically active and was elected justice of the peace of Mugron in 1831 and to the Council General (county-level assembly) of Landes in 1832. Bastiat was elected to the national legislative assembly soon after the French Revolution of 1848. Until the day of my death, I shall proclaim this principle with all the force of my lungs (which alas! is all too inadequate). This last line is understood by translators to be a reference to the effects of his tuberculosis. During the autumn of 1850, he was sent to Italy by his doctors and he first traveled to Pisa, then to Rome. On 24 December 1850, Bastiat called those with him to approach his bed and murmured twice the words "the truth" before he died. Under extraordinary circumstances, for urgent cases, the State should set aside some resources to assist certain unfortunate people, to help them adjust to changing conditions". Among his better known works is Economic Sophisms, a series of essays (originally published in the Journal des économistes) which contain a defence of free trade and many strongly worded attacks on statist policies. Bastiat wrote the work while living in England to advise the shapers of the French Republic on perils to avoid. Economic Sophisms was translated and adapted for an American readership in 1867 by the economist and historian of money Alexander del Mar, writing under the pseudonym Emile Walter. Contained within Economic Sophisms is the satirical parable known as the candlemakers' petition in which candlemakers and tallow producers lobby the Chamber of Deputies of the French July Monarchy (1830–1848) to block out the Sun to prevent its unfair competition with their products. Also included in the Sophisms is a facetious petition to the king asking for a law forbidding the usage of everyone's right hand, based on a presumption by some of his contemporaries that more difficulty means more work and more work means more wealth. Bastiat's most famous work is The Law, originally published as a pamphlet in 1850. It defines a just system of laws and then demonstrates how such law facilitates a free society. Socialism, like the ancient ideas from which it springs, confuses the distinction between government and society. As a result of this, every time we object to a thing being done by government, the socialists conclude that we object to its being done at all. We disapprove of state education. Then the socialists say that we are opposed to any education. We object to a state religion. Then the socialists say that we want no religion at all. We object to a state-enforced equality. Then they say that we are against equality. And so on, and so on. It is as if the socialists were to accuse us of not wanting persons to eat because we do not want the state to raise grain. I do not dispute their right to invent social combinations, to advertise them, to advocate them, and to try them upon themselves, at their own expense and risk. But I do dispute their right to impose these plans upon us by law – by force – and to compel us to pay for them with our taxes. Bastiat posits that the law becomes perverted when it punishes one's right to self-defense (of his life, liberty and property) in favor of another's right to legalized plunder which he defines as "if the law takes from some persons what belongs to them, and gives it to other persons to whom it does not belong. See if the law benefits one citizen at the expense of another by doing what the citizen himself cannot do without committing a crime" in which he includes the tax support of "protective tariffs, subsidies, guaranteed profits, guaranteed jobs, relief and welfare schemes, public education, progressive taxation, free credit, and public works". According to Bastiat, legal plunder can be committed in "an infinite number of ways. Thus we have an infinite number of plans for organizing it: tariffs, protection, benefits, subsidies, encouragements, progressive taxation, public schools, guaranteed jobs, guaranteed profits, minimum wages, a right to relief, a right to the tools of labor, free credit, and so on, and so on. All these plans as a whole — with their common aim of legal plunder — constitute socialism". Bastiat also made the following humorous point: "If the natural tendencies of mankind are so bad that it is not safe to permit people to be free, how is it that the tendencies of these organizers are always good? Do not the legislators and their appointed agents also belong to the human race? Or do they believe that they themselves are made of a finer clay than the rest of mankind?" In his 1850 essay "Ce qu'on voit et ce qu'on ne voit pas" ("What is Seen and What is Unseen"), Bastiat introduced through the parable of the broken window the concept of opportunity cost in all but name. This term was not coined until over sixty years after his death by Friedrich von Wieser in 1914. Bastiat also famously engaged in a debate between 1849 and 1850 with Pierre-Joseph Proudhon about the legitimacy of interest. As Robert Leroux argued, Bastiat had the conviction that Proudhon's anti-interest doctrine "was the complete antithesis of any serious approach". Proudhon famously lost his temper and declared to Bastiat: "Your intelligence is asleep, or rather it has never been awake. You are a man for whom logic does not exist. You do not hear anything, you do not understand anything. You are without philosophy, without science, without humanity. Your ability to reason, like your ability to pay attention and make comparisons is zero. Scientifically, Mr. Bastiat, you are a dead man". Bastiat asserted that the sole purpose of government is to protect the right of an individual to life, liberty and property and why it is dangerous and morally wrong for government to interfere with an individual's other personal matters. From this, Bastiat concluded that the law cannot defend life, liberty and property if it promotes legal or legalized plunder which he defined as using government force and laws to take something from one individual and give it to others (as opposed to a transfer of property via mutually-agreed contracts without using fraud nor violent threats against the other party which Bastiat considered a legitimate transfer of property). In The Law, Bastiat explains that if the privileged classes or socialists use the government for legalized plunder, this will encourage the other socioeconomic class to also use legal plunder and that the correct response to both the socialists and the corporatists is to cease all legal plunder. Bastiat also explains in The Law why his opinion is that the law cannot defend life, liberty and property if it promotes socialist policies. When used to obtain legalized plunder for any group, he says that the law is perverted against the only things (life, liberty and property) it is supposed to defend. Bastiat was a strong supporter of free trade who was inspired by and routinely corresponded with Richard Cobden and the English Anti-Corn Law League and worked with free-trade associations in France. We cannot doubt that self-interest is the mainspring of human nature. It must be clearly understood that this word is used here to designate a universal, incontestable fact, resulting from the nature of man, and not an adverse judgment, as would be the word selfishness. One of Bastiat's most important contributions to economics was his admonition to the effect that good economic decisions can be made only by taking into account the "full picture". That is, economic truths should be arrived at by observing not only the immediate consequences—that is, benefits or liabilities—of an economic decision, but also by examining the long-term second and third consequences. Additionally, one must examine the decision's effect not only on a single group of people (say candlemakers) or a single industry (say candlemaking), but on all people and all industries in the society as a whole. As Bastiat famously put it, an economist must take into account both "What is Seen and What is Not Seen". Bastiat's "rule" was later expounded and developed by Henry Hazlitt in his work Economics in One Lesson in which Hazlitt borrowed Bastiat's trenchant broken window fallacy and went on to demonstrate how it applies to a wide variety of economic falsehoods. Even if the producers in a society are benefited by these tariffs (which they are not, according to Bastiat), the consumers in that society are clearly hurt by the tariffs as they are now unable to secure the goods they want at the low price at which they should be able to secure them. The tariffs completely negate any gains made by the railroad and therefore make it essentially pointless. To further demonstrate his statements, Bastiat suggests—in a classic reductio ad absurdum—that rather than enacting tariffs, the government should simply destroy the railroad anywhere that foreign goods can outcompete local goods. Since this would be just about everywhere, he goes on to suggest that this government should simply build a broken or "negative" railroad right from the start and not waste time with tariffs and rail building. Bastiat died in Rome and is buried at San Luigi dei Francesi in the center of that city. He declared on his deathbed that his friend Gustave de Molinari (publisher of Bastiat's 1850 book The Law) was his spiritual heir. Bastiat, Frédéric (1848). Propriété et loi, Justice et fraternité (in French). Paris: Guillaumin et Cie. Retrieved 12 May 2012. Bastiat, Frédéric (1849). L'État, Maudit argent (in French). Paris: Guillaumin et Cie. Retrieved 12 May 2012. Bastiat, frédéric (1849). Incomptabilités parlementaires (in French). Paris: Guillaumin et Cie. Retrieved 12 May 2012. Bastiat, Frédéric (1849). Paix et liberté ou le budget républicain (in French). Paris: Guillaumin et Cie. Retrieved 12 May 2012. Bastiat, Frédéric (1849). Protectionisme et communisme (in French). Paris: Guillaumin et Cie. Retrieved 12 May 2012. Bastiat, Frédéric (1983). Oeuvres économiques. Libre échange (in French). Textes présentés par Florin Aftalion. Paris: PUF. ISBN 978-2-13-037861-7. Bastiat, Frédéric (2005). Sophismes économiques. Bibliothèque classique de la liberté (in French). Préface de Michel Leter. Paris: Les Belles Lettres. ISBN 978-2-251-39038-3. Bastiat, Frédéric (2009). Pamphlets. Bibliothèque classique de la liberté (in French). Préface de Michel Leter. Paris: Les Belles Lettres. ISBN 978-2-251-39049-9. ^ "Frederic Bastiat". Encyclopædia Britannica. ^ Initiated in 1820 at "La Zélée" lodge in Bayonne (La Franc-maçonnerie à Bayonne, 1980). ^ a b c d Thornton, Mark (11 April 2011) Why Bastiat Is Still Great, Mises Institute. ^ a b c d Roche III, George Charles (1971). Frédéric Bastiat: A Man Alone. New Rochelle, New York: Arlington House. ISBN 978-0-87000-116-1. ^ "Justice and fraternity" (15 June 1848). Journal des Économistes. p. 313. ^ Bastiat, Frédéric  (1996). "Economic Sophisms". Goddard, A. (trans.). Irvington-on-Hudson, New York: The Foundation for Economic Education. Retrieved 12 December 2008. ^ Walter, Emile (del Mar, Alexander, pseud.) (1867). What is free trade? An adaptation of Frederick Bastiat's "Sophismes economiques". New York: G.P. Putnam and Son, repr. Dodo Press. ISBN 978-1-4099-3812-5. ^ Bastiat, Frédéric. "Candlemakers' petition" (PDF). Archived from the original (PDF) on 31 October 2005. Retrieved 12 December 2008. ^ "Bastiat: Economic Sophisms, Series 2, Chapter 16". Library of Economics and Liberty. Retrieved 3 March 2013. ^ Frédéric Bastiat. "The Law" (PDF). Retrieved 29 March 2015. ^ "Bastiat-Proudhon Debate on Interest". Praxeology.net. Retrieved 2 December 2008. ^ Leroux, Robert. "Political Economy and Liberalism: The Economic Contribution of Frédéric Bastiat" Routledge, 2011, p. 118. ^ Roche, Charles George. "Frederic Bastiat: A Man Alone". Arlington House, 1971, p. 153. ^ a b Bastiat, Frédéric. The Law. Ludwig von Mises Institute, 2007. ^ Thornton, Mark. "Frédéric Bastiat as an Austrian Economist". Mises.org. ^ Frédéric Bastiat (1873). Economic Sophisms. Oliver and Boyd. Chapters 13–23. Boyack, Connor; Stanfield, Elijah (Illustrator) (2014). The Tuttle Twins Learn About The Law. Libertas Press. ISBN 978-0989291224. A version of The Law written for young children. 55 pp. (in English). Foville, A. de. “Bastiat” (1900). In http://gallica.bnf.fr/ark:/12148/bpt6k224270/f192.image Nouveau dictionnaire de l’économie politique]. Deuxième édition. Tome premier. A–H. Publié sous la direction de M. Léon Say et de M. Joseph Chailley, 170–172. Paris: Guillaumin et Cie (in French). Garello, Jacques (16 February 2011). "Portrait : Bastiat (1801–1850)". La Nouvelle Lettre (in French) (1067): 8. Retrieved 12 May 2012. Hülsmann, Guido (2008). "Bastiat, Frédéric (1801–1850)". In Hamowy, Ronald (ed.). Bastiat, Frédéric. The Encyclopedia of Libertarianism. Thousand Oaks, CA: SAGE; Cato Institute. pp. 25–27. doi:10.4135/9781412965811.n16. ISBN 978-1-4129-6580-4. LCCN 2008009151. OCLC 750831024. Leroux, Robert (2011). Political Economy and Liberalism in France : The Contributions of Frédéric Bastiat. Routledge Studies in the History of Economics. London: Routledge. ISBN 9781136795145. Roche, George Charles III (1971). Frédéric Bastiat: A Man Alone. Architects of Freedom Series. New Rochelle: Arlington House. Retrieved 12 May 2012. Russell, Dean (1969). Frédéric Bastiat: Ideas and Influence. Irvington-on-Hudson: Foundation for Economic Education. Un libéral : Frédéric Bastiat (in French). Toulouse: Presses de l'Institut d'Études Politiques de Toulouse. 1988.